. 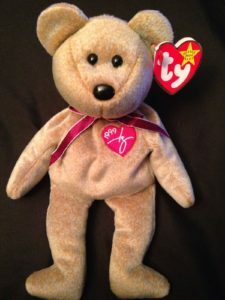 They claim that the Signature Bear has some sort of rare error on the tush tag. While the name “Gasport” is used instead of “Gosport” on the inside of the swing tag, this error shows up on just about every Signature Bear made. Neither version is worth anything. It appears to be an uncorrected error by Ty, which means that there is no added value to any of the Signature Bears.